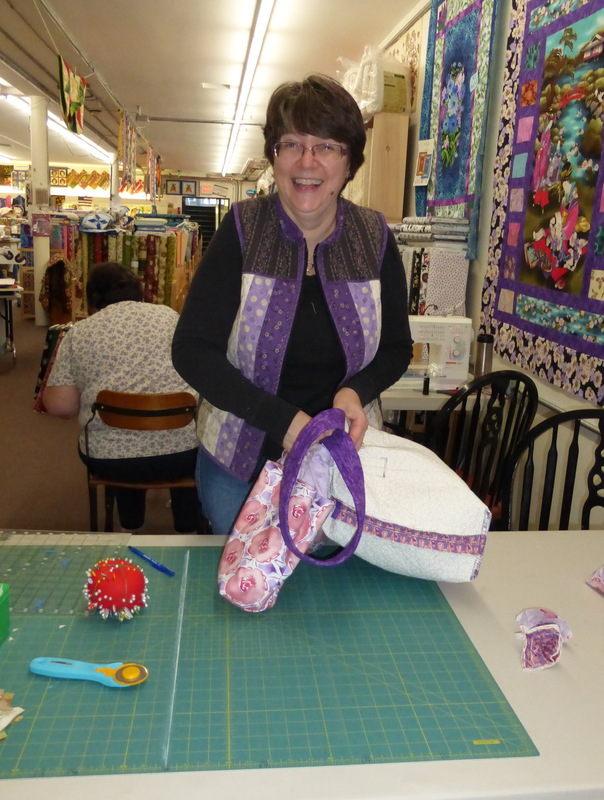 I am so glad I found time to take a class at Quilters Common yesterday. Thank you Pat for doing such a great job of guiding us through the process of making the Pink Sand Beach Designs Barbados Bag. We all had great success getting our bags put together during the class. The pattern has lots of pictures and step by step instructions, but it always helps to get confirmation that you are doing the right thing when there are so many details. And, I discovered how to put tabs on the ends of the zippers, which makes for a much more finished look. Can’t believe how easy it is to do! If you get this pattern the only suggestion I have is to prepare the tabs for attaching the D rings to the bag separately rather than cutting them from the strap, and don’t use the fusible fleece for these tabs. Use the durabond on both sides. This makes it easier to fold the ends over. Also, I used hardware to make my bag adjustable for wearing over the shoulder or cross body. It’s a well written pattern and makes a versatile little bag with just the right amount of structure to it. I am already thinking of other fabric choices for a second one. 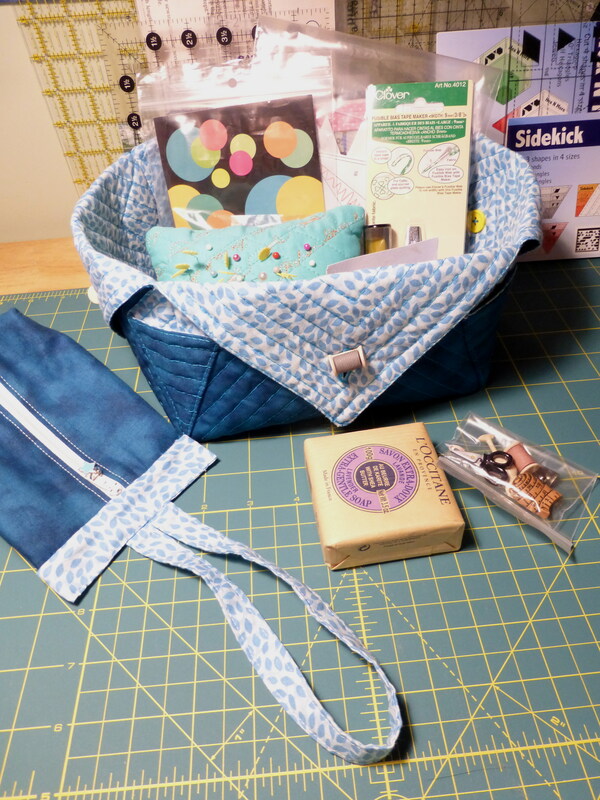 This entry was posted in Class, Totes and tagged Barbados bag, Purse, Quilters Common on November 8, 2015 by pmegio. Here is a quick pattern for a Holiday Gift Bag. This little pouch is a good size for a bottle of wine or perhaps a bottle of Pear Vodka for your Hairdresser! Debi was VERY happy with her Pear Vodka. Start with two coordinating pieces of fabric each 15″ x 18″ and one 20″ piece of ribbon. 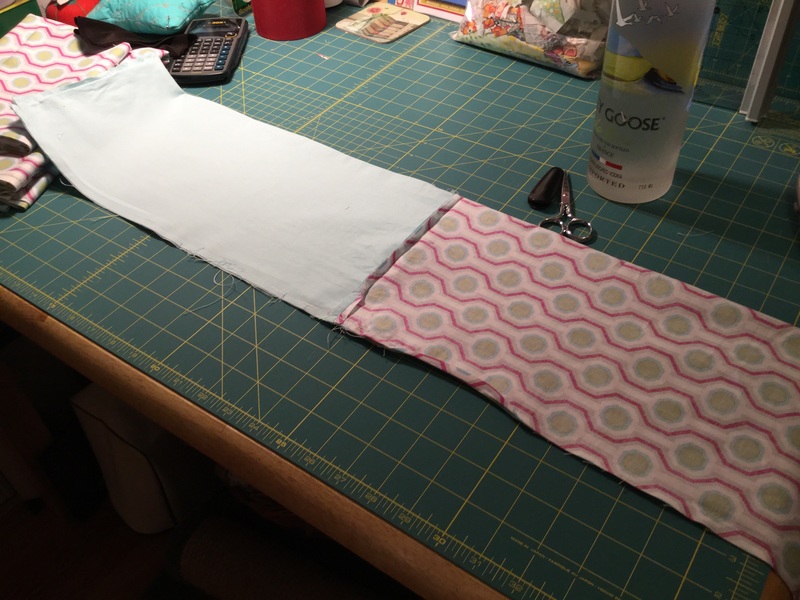 Place the two pieces of fabric right sides together and sew a seam across the short edge on one side. 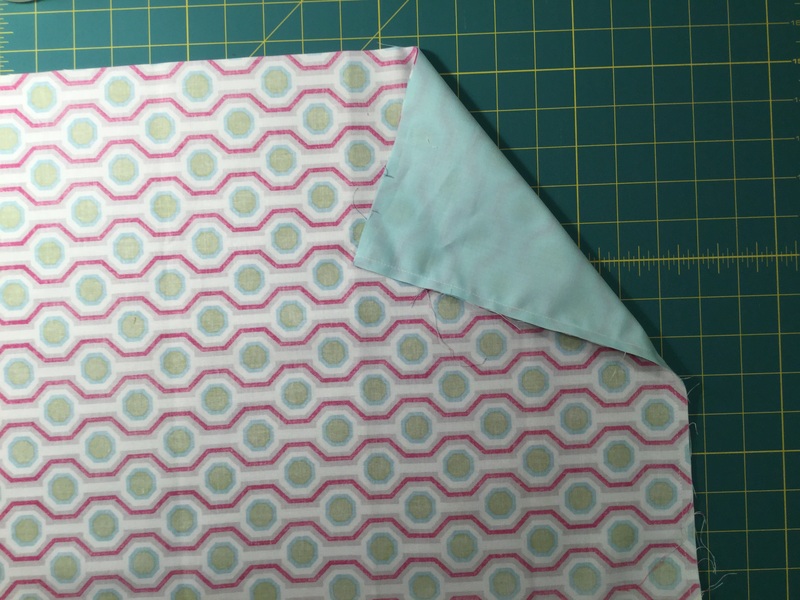 Open up the two pieces with the seam in the middle and fold in half lengthwise, right sides together. Start on the fabric you want on the outside edge about 4″ or so from the first seam sewn. The starting point can be adjusted depending on the length of the neck of your gift bottle. Sew from this point towards the inside (lining) fabric and continue along until you get around the first corner. Then STOP! 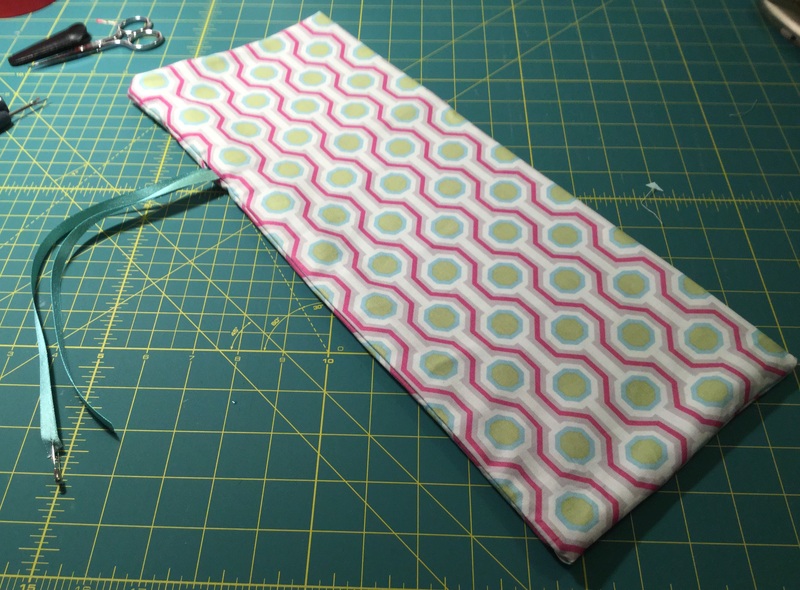 Leave a gap of a few inches, so you can turn everything right side out, and start sewing again until you get to the folded edge, and then stop. 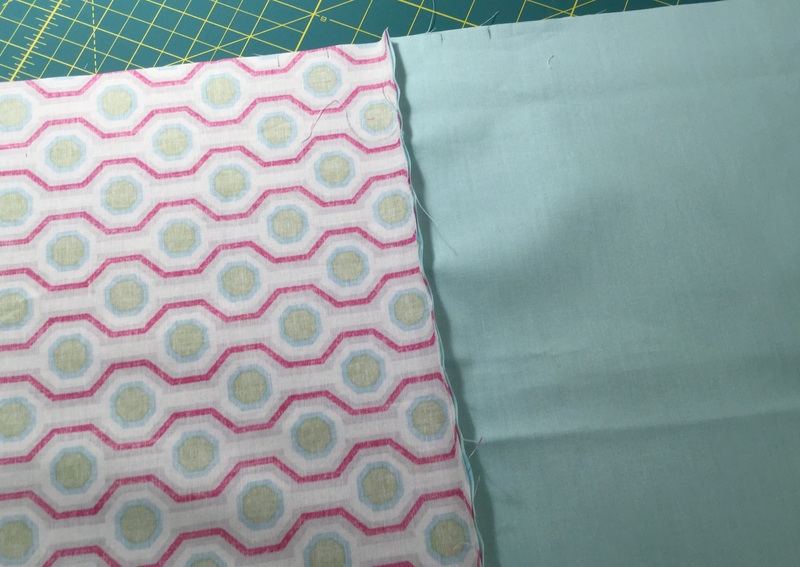 Start again at the fold by the bottom of the outside fabric and continue towards where you first started, but STOP before you reach that point to leave an opening that is large enough for your ribbon. Don’t forget to secure your stitches when starting and stopping. My stitching is a bit messy because my first ribbon gap was too high! Now, reach inside the opening and scrunch the tube up until you reach the other end and pull it through so your tube is now right side out. Adjust the corners and press the opening closed. Sew along the bottom edge to close the opening. Fold the lining inside of the bag (it is now a bag!). Find the ribbon opening on the side seam. Pin a safety pin to one end of your ribbon and run it through the hole, around the bag and out again. 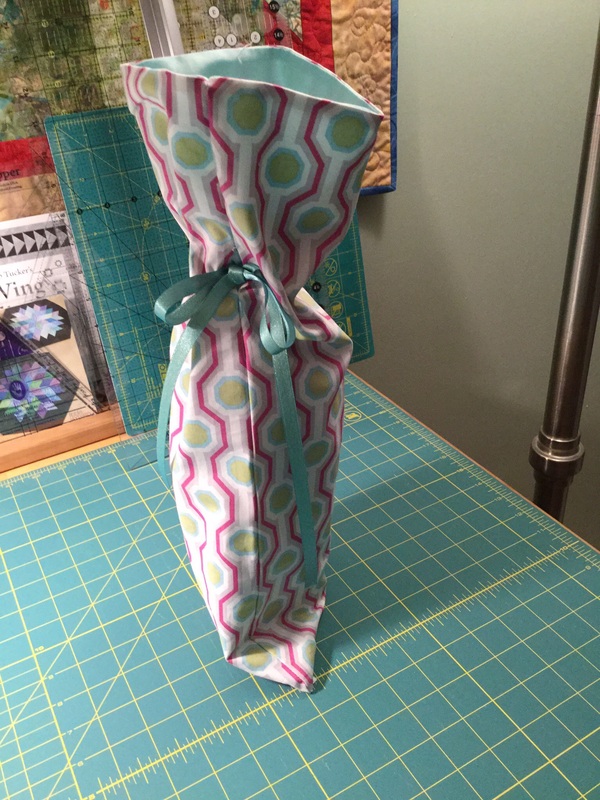 Put your bottle in the bag, tie the ribbon and clip the ends. Debi said she liked the gift bag, too! This pattern can be adjusted as needed to accommodate any gift! This entry was posted in and Other Stuff, Patterns, Sewing, Totes and tagged bottle bag, Christmas, Christmas gift bag, Gift bag, holiday on December 8, 2014 by pmegio. This tote bag went together very quickly with 4 half yards of home dec fabric. Very stylish don’t you think? I added a strip of orange trim using a clover bias tape maker with fusible web tape. This bag has pockets on the inside or reverse it and suddenly it has pockets on the outside! I got together with some of the ladies from the North Parish Quilt Guild on Saturday at Quilters Common and got a good start on this bag. We are putting bags together to raise funds for the guild. I believe there will be an auction held in April to sell all of our bags. I will share the details once I know them. This entry was posted in Totes and tagged home dec, reversible, tote bag on January 23, 2014 by pmegio. Just wanted to share this cute little cosmetic bag that I made to go with my beach bag. I was heading over to our friend’s house for a day at the pool and all I had were quilted bags and of course I knew my wet bathing suit would soak through those! I had some left over pet screen from my beach bag so I put this together … the next day … to replace the plastic zip lock bag that I used that day. 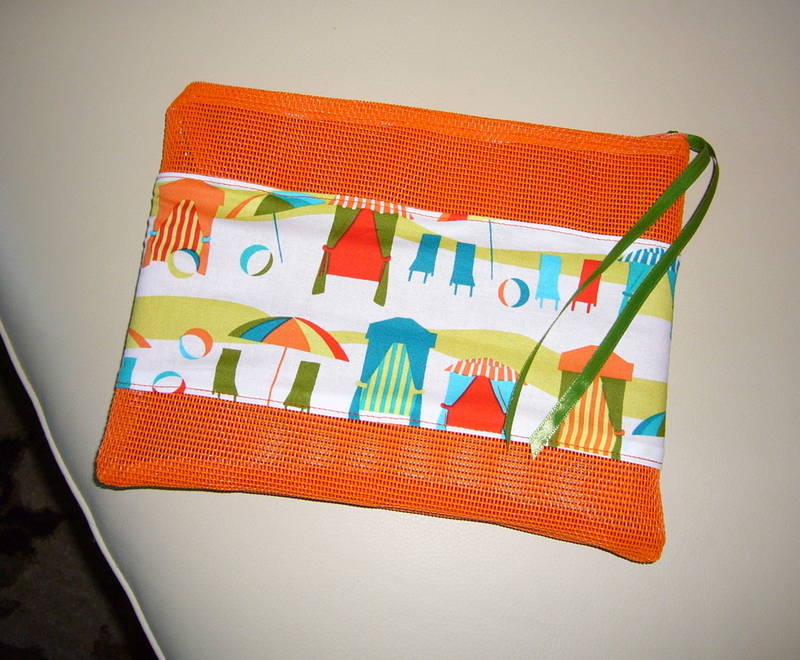 This entry was posted in Sewing, Totes and tagged bag, cosmetic, pet, screen, tote, waterproof on July 6, 2013 by pmegio.